This week finds all who are participating in the #2015PCChallenge in week 15. Ask yourself how you are doing so far. We all have the uncanny ability to make awesome resolutions (just think of the things you said you’d do at the start of 2015 that you aren’t doing anymore), but sticking to them is another challenge. Have you done an evaluation to see how your #2015PCChallenge is going? http://t.co/GGuo2TdnSl If not, it’s time you do! One of the hardest parts about committing to something like the 2015 Polymer Clay Challenge is that it requires not only the ability to push yourself, but also the ability to be creative (even during a creative dry spell) and continuously come up with new ideas. APRIL CHALLENGE: If you are participating in the #2015PCChallenge, be sure to take some time this month and write up a blog post that let’s all of us who are participating see how you’re doing. Be sure to link you blog post in our group page on FB or leave the link to your post right here in the comments below. I want to see what you’ve been doing & so do a lot of other people. Well here’s the confessionary part of this post. With all the tutorials I’ve been writing, workshops I’m preparing to teach, and the general work of keeping up … My best friend Parker & I had to have a little discussion. Parker was only one facet of my personal challenge for 2015. However … from 2012-2014 I created no less that one Parker StoryBook Scene a week and many weeks I had more than one StoryBook Scene. In addition, since Parker was established on Sept 3, 2011 I have created no less than 100 different individual Parker figurines. So … I asked Parker if it was okay if we took a break for a bit so I could focus more on making awesome tutorials for my Club Members and writing for company’s and book’s as well. He thought that would be okay … but just for a bit. So Parker & I will be back later in the year with some new StoryBook Scenes as they take root in my heart & in Parker’s little world. I have a thing for fantasy (I bet you didn’t know that) and make-believe. Dragons (the cute kind naturally) help to fill that void. Since Parker’s is busily exploring the Magical Creature Containment Zone, you just never know what he’s going to find. So far he has found only dragons, but you can be sure that there are more than just dragons that live in the Magical Creature Containment Zone. One day while Parker was exploring Kater’s Acres, he found a wall of brick overgrown with moss deep within the Magical Forest. There was a bright yellow plaque behind the moss, but he couldn’t read what it said. As curious as ever, Parker took his hand and pushed back the moss to reveal a sign that read “Magical Creature Containment Zone.” Parker just knew he had to find out what laid behind that wall, waiting for him to find. As he searched and found each dragon, he gave them a quick kiss on their head, where a now permanent “Parker shaped spot” appears. And there you have it…The Magical Creature Containment Zone is very important to Parker (although Lolly is so afraid she won’t dare go near it). So these dragons are not only fun to adopt & collect, but they make me (and Parker) very happy. For now, happiness is a void that I want to fulfill in my creative endeavors. When you get lost in the “work” you need something to make you happy … for now the dragons are it! Often we forget to have fun along the way in our creative endeavors. I choose to always keep a little “fun” in my studio at all times! 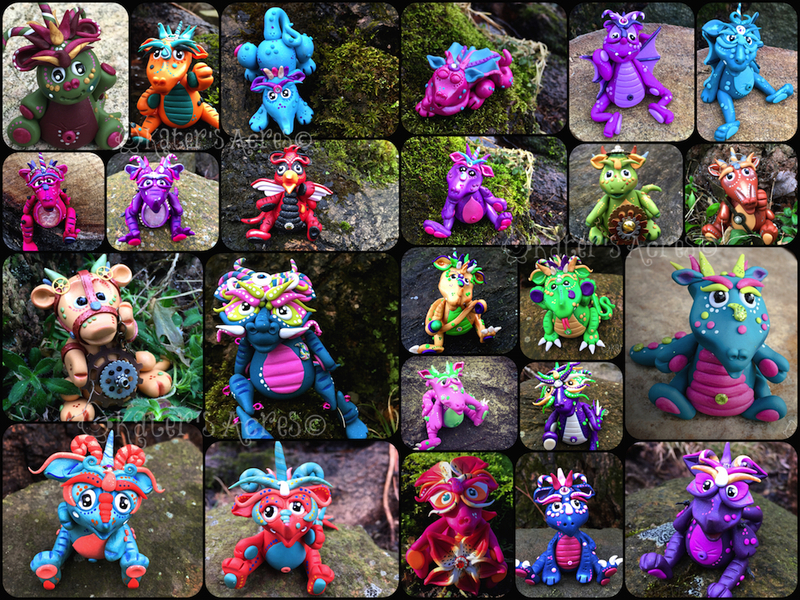 Many of these dragons already have homes and have been adopted. However, many are still in need of forever homes. You can adopt them here.